#TrackingTransMountain comes from The Discourse, APTN News and HuffPost Canada. People rally at a “Picnics not Pipelines” event in Kamloops, B.C. on April 22, 2018. 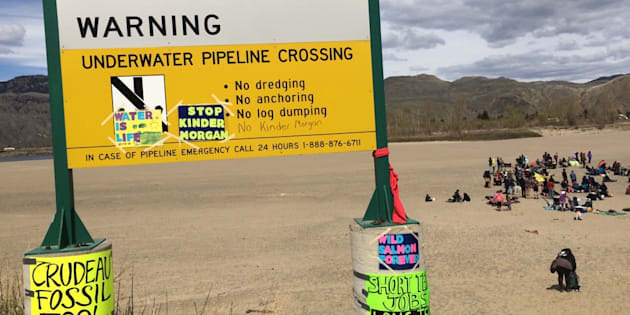 If Kinder Morgan's Trans Mountain expansion project proceeds, the land, resources and rights of more than 130 Indigenous communities and groups from Alberta's oilsands to British Columbia's coast could be affected. Because of this, the Canadian government and Kinder Morgan have a legal obligation to meaningfully consult with them. The pipeline company points to the 43 communities that have signed some form of agreement to show Indigenous support for the project. But many opposed to the project say there hasn't been meaningful consultation. Six First Nations are arguing consultation was inadequate in court and a single judge ruling in their favour could put the project back to square one. So, what's the truth? Reporters across Canada are documenting a range of Indigenous voices that express support, concern and everything in between. These stories sometimes conflict, adding noise to a confusing but important part of the Trans Mountain story and leaving room for industry, anti-pipeline activists and others to make competing claims to support their position. #TrackingTransMountain aims to present a clearer picture of the state of consultation across all of the communities affected. Building from the hundreds of pages of official documents, existing reporting and interviews with leaders and community members themselves, The Discourse, APTN News and HuffPost Canada hope to offer context to help inform discussions about what's happening. We're contacting every Indigenous community identified in Kinder Morgan's most recent report on Indigenous engagement to the National Energy Board. The database aims to include as many perspectives as possible, but not every community has gotten back to us yet. In the meantime, we're filling it in with official documents from the consultation process. We know there are still holes to fill and perspectives missing. If you have information that to add, fill in this survey. We'll continue to add information and report on it as it comes in. Texas-based Kinder Morgan gave the Canadian government until May 31 to bring certainty to the $7.4-billion project. On May 29, 2018, the federal government announced that they are buying the Trans Mountain pipeline and infrastructure from Kinder Morgan for $4.5 billion. The question of Indigenous jurisdiction and consultation is not going anywhere. Neither are future decisions affecting the rights of hundreds of Indigenous communities. No single story can fully capture what's really at stake. But we believe reporters can improve coverage of these complex issues by collaborating with each other and the public. Follow #TrackingTransMountain on Facebook and Twitter to get the latest updates and stories from our collaborative reporting efforts.